Our dentists are trained to recognize and treat conditions unique to growing children. At Children’s National, a trip to the dentist is about more than just a healthy smile. Our dental clinic offers comprehensive oral health program specifically designed with children in mind. From check-ups to complex dental procedures our team knows how to make your child’s visit as comfortable and painless as possible. Oral Health at Children’s National: Why Choose Us? We know that going to the dentist even for a routine cleaning can be an unsettling prospect for young patients. And when a child has a physical condition, developmental issue or social difficulties, it can make their oral health care a little more challenging. Even if your child is just anxious about going to the dentist, we can help make their experience smooth and uneventful. Our doctors are uniquely qualified to deal with kids that have physical or mental issues, facial problems, or injuries to their face and jaw. Since their training is specific to children, they are able to recognize and treat conditions unique to growing kids. Routine dental check-ups and cleanings. Infant oral health – establishing good oral health routines is essential even at the youngest ages. Sealants – a thin, protective coating on back teeth to prevent tooth decay. Fillings and Crowns - repair damage from trauma or damage caused by cavities. No matter the procedure, our dentists and dental assistants will be there to work with you every step of the way. Our Orthodontic team helps children with anything from crowded teeth to complicated conditions such as a misaligned jaw. The orthodontists in our program are experts in the most up to date treatment techniques and make use of the latest materials. Their consults with your child’s dentist can determine the correct treatment to minimize the amount of time your child has to wear braces or other corrective devices. Our Oral Surgeons may become part of the care team if a child has experienced a traumatic injury to the face, has a facial problem or dental infection, or just needs wisdom teeth removed. Our surgeons are specially trained in pediatrics and will care for your child in a safe and comfortable manner. 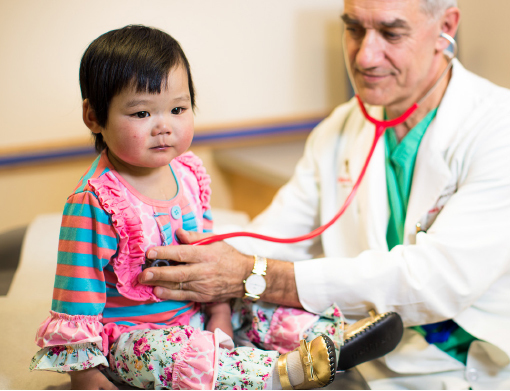 If your child needs anesthesia for a procedure, you can feel confident in the fact that Children's National is the only hospital in the Washington, DC, area that guarantees a that fellowship-trained pediatric anesthesiologist will administer anesthesia at all times. Our Oral Health Program accepts new patients that are 8 years old or younger, patients with special needs that are 14 years old or younger, and new patients older than 14 years old after a consultation with a dentist. Please call us at 202-476-2160 to make an appointment. This facility has been expanded to provide greater access to dental care for the community.